Moved the control panel from a floating card to a left side toolbar. Added search capabilities for your desktops. Added a clearer indication of what account you are using to sign into simplebooklet. Reduced the google account connection requirements to a restricted folder on your google drive. Use edit mode to add and update your desktop from your mobile phone. New backgrounds - designed to help you organize content on your desktop. New middlespot desktop providing you quick links and the latest information on what we're up to. New stickers to add to your desktop. New homepage and help screens to guide you through all the updates and what you can do with middlespot. Block followers of your public desktop. New feedback tool to let us know how we can continue to improve. New font families to make your notes more engaging and additional font sizes and an HR line break. As you probably noticed, the biggest update is to the user interface. We've focused on reducing the number of taps it takes to interact with your desktop and move between desktops. 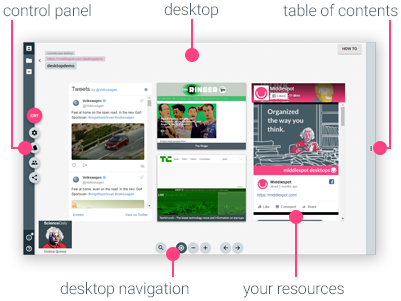 We've also worked to increase the visible space of your desktop and make the tools much less intrusive. Under the hood, we've also made significant progress in improving the flow and movement of your desktop. We've been able to smooth the motion in dragging and zooming when using your mouse. You'll also notice an improvement in the touch actions on your mobile phone. As always, we really appreciate the feedback and the features you'd like to see as we work towards a tool that you can't live without.